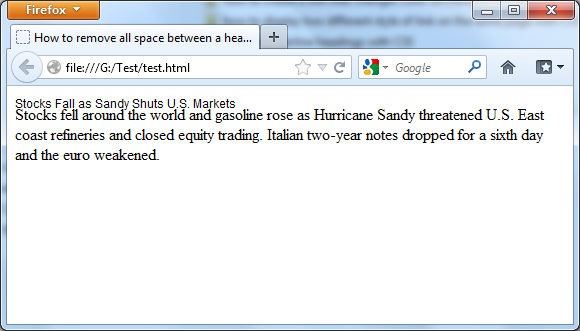 Browsers render a gap between heading and paragraph tag, by applying default top and bottom margins to these tags. If you want to remove all space between a heading and the paragraph that follows it, you have to remove the bottom margin from the heading and the top margin from the paragraph. The easiest way is to simply assign a negative bottom margin to the heading. Note: Margins can be set to negative values, though padding cannot. The next CSS code illustrates this. Stocks fell around the world and gasoline rose as Hurricane Sandy threatened U.S. East coast refineries and closed equity trading. Italian two-year notes dropped for a sixth day and the euro weakened.